Here is a great recipe from my Grandma. Who doesn't like homemade bread? It is always so good isn't it - with some hot butter and jam on it. Homemade bread always hits the spot. Bread isn't that hard to make so don't let yourself think that - it just takes a little practice so try and see. Mix your milk, shortening, sugar and salt together and set that aside. Mix together in another bowl your flour and dough enhancer. In small bowl put in your warm water, yeast and pinch of sugar. Do not stir this so the yeast can start working. With yeast you always need it in something warm and something for it to eat off of. Don't have the water too hot - just warm. And your sugar is for your yeast to start eating on. Now, after about 8 minutes mix your yeast mixture in with your flour mixture. When that is all mixed good add your bowl that has your milk in it and mix this all together. At this point you will start adding flour and start kneading the mixture. You will add around 5 to 6 cups of flour while your are kneading. Next you will get a clean bowl and place your dough into it and cover. Let your dough raise double it's size and then punch your dough. Let it rise some more after you have punched it the knead your dough into you bread sizes and place them in your greased bread pans. Let your dough raise some more in your bread pans. Bake your bread at 350 degrees until they are lightly to medium brown. This is around 50 minutes to 1 hour and 15 minutes. Every oven is different so watch your bread. It should be done when you knock on it and it sounds hollow inside. Take your bread out of the pan and let it cool on a wire rack. Enjoy your delicious bread. *Note: If you do not have any dough enhancer (this is found by the yeast) I have made it without and it seems to be just find. It just helps enhance your dough. You can use your Bosch mixer or your hands. *Reason to punch dough:Rising the first time improves the flavor and texture of bread, and is an important step in bread-making. During rising, the dough will go through a magical transformation. From the yeast's fermentation, it takes time to accumulate a volume of carbon dioxide gas during the risings, strong enough to stretch a bread dough and to hold it high. On the outside, you'll see the dough expanding like a balloon, and at the proper time, the dough should be deflated an prepared for a second rising. During the second rising, the gluten, which is comprised of two different proteins, begins to repair and pull together, which also makes the bread dough easier to work with. 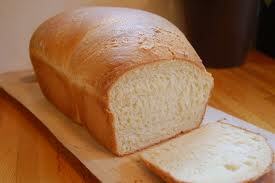 Yeast, a single-celled live organism, feeds on the starches in the flour and doubles in number. All of these by-products are important when making bread: the carbon dioxide causes the air bubbles created in the dough to expand or rise, the alcohol contributes to the bread's flavor, and an organic acid glutamathione, relaxes the dough and gives it more elasticity. This allows it to absorb surface water, making the dough less sticky. In the process of baking with yeast, gluten is responsible for keeping the fermentation gases in the dough, allowing it to rise. After baking, the coagulated gluten ensures that the final product keeps its shape. The second rising is to allow the gluten more time to do its thing!